Lotto 6aus49 is a German lottery that has been available to play since 1974. 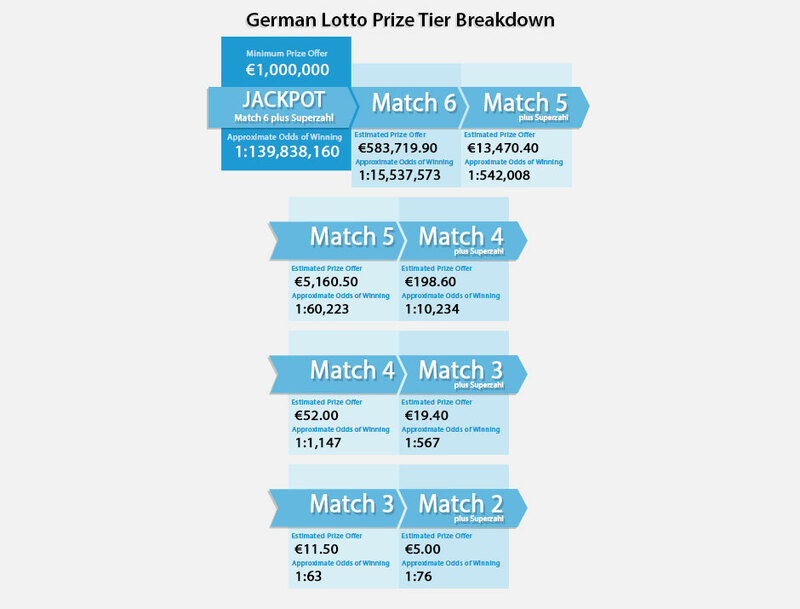 It is one of the oldest, most respectable and most popular lotteries in Germany that has awarded players from around the world with millions of prizes. The largest German Lotto 6aus49 jackpot was €45.4 Million, which was won last December 2007 by three winning tickets. Draw happens twice a week every Wednesday and Saturday at 18:00 CET. To win the jackpot, your ticket must match 6 main numbers and 1 Bonus number called "Superzahl". Minimum jackpot during Wednesday draw is €1 Million and €3 Million for Saturday draw. Choose 6 main numbers from 1-49 or use our "Lucky Pick" random number generator to choose for you. Note:The system auto generates 1 number from 0-9 called “Superzahl” number for every ticket played. There are total of 9 prize categories offered when playing Lotto 6aus49. To win the jackpot, you must match all 7 drawn numbers. The table below shows the full breakdown of Lotto 6aus49 winning prize tiers, including the approximate odds of winning and estimated prize amount.